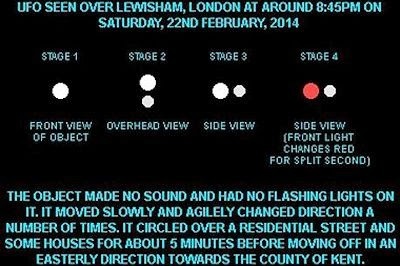 A Lewisham family of UFO buffs are looking for other witnesses to an "intelligently-controlled" triangular object which flew over their house towards Kent. Les Burlington, 68, first spotted the UFO - a bright white light in the sky moving from their Cliffview Road house towards Hilly Fields - on February 22 at around 8.45pm as he was putting out the recycling. He called to his son Andrew, who was inside watching an online video about the Roswell incident, and they both watched from the back garden, making out two white lights, one of which turned red "for about a second". Andrew Burlington, 38, said he had ruled out the UFO being a Chinese lantern as it moved slowly and changed direction a number of times. He said: "Whatever it was, we all agree on one thing - it was being intelligently controlled." . . .